Evil always threatens the world, but the flames of justice never goes away because the warriors known as Kamen Riders keep peace in the world. In April of 2011, the world is conquered by the evil organization Shocker. Where are the Kamen Riders to protect the people? Kamen Rider OOO helps Den-O and New Den-O as they battle Mole Imagin. They chase Mole Imagin back in time to November 11,1971. There, they are able to defeat Mole Imagin and come back to the present day of April 1st, 2011. But, the world has changed and the evil organization Shocker now dominate the world. Kamen Rider 1 and Kamen Rider 2 are now the top henchmen of the Shocker organization. It appears that the timeline of the world was accidently changed when Ankh left behind an O Medal when Kamen Rider OOO, Den-O, and New Den-O chased Mole Imagin back to November 11, 1971. 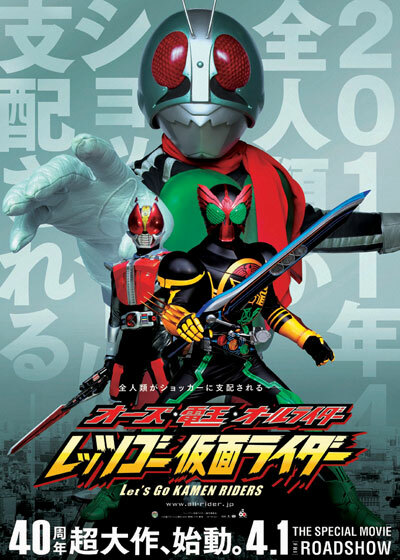 Now, Kamen Rider OOO stays in the present day to fight the Shocker organization and the others go back to the past to change the future.